A - The dollar amount that you must achieve to unlock the SG. B - The title of the SG. C - Pladge Level (PL): stamps represent the three levels of pledge that you can buy. When you see them in the box of a SG will mean that the reward will be free for that particular PL. In this example, the reward is free for all three PL. D - Picture of the reward. E - The Tape: when the Tape is intact the SG has yet to be reached, When you see it broken will mean that the SG has been unlocked! F - The Banners: some SG may have a different amount of rewards depending on the PL you have chosen. 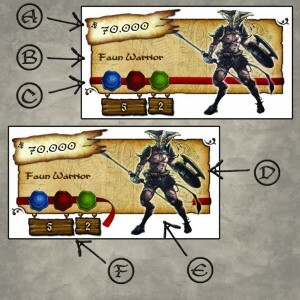 In this case, for example, the Green PL (Count level) will reward you with two fauns warriors, while levels Red (King Level) and Blue (Emperor level) will have five fauns warriors for free! I hope everything will be clear but do not hesitate to ask for further explanation, and above all let us know what you think about. Stay tuned... Renaissance is coming!! !